Seaside Cottage, Lovingly Restored- Amenties! Birch Bay Get Away, offers a perfect sanctuary. Located a stone’s throw from the living waters of the Pacific, we ask you to enjoy the serenity and tranquility.Reclaim your inner peace while joining harmony and nature here at the Get Away. In all seasons, Birch Bay Get Away provides you with tranquility and connection! Contemplation and repose will come to you as naturally as the beautiful sunsets, For any vacation, holiday, romantic getaway or business travel, or for any reason, choose the "Birch Bay Get Away"... you'll be glad you did! This 1 bedroom cottage has an open floor plan & sits back in the privacy of our cobblestone courtyard.This cottage & has a warm and charming rustic cedar interior making this cottage comfortable for up to two people. A covered deck with a wrought iron rail provides for the perfect intimate setting. This FULLY EQUIPPED cottage has radiant gas heat with all the ameneties, including full kitchen with granite countertops, dishwasher,toaster, coffee pot & filters, microwave FREE WIFI ,32″CTV, full linens (towels), basic cooking pots, utinsels and plateware. Fans are available for warmer weather when the cool seabreeze isn’t enough. It is situated near two of the facilities gas fired BBQ’S. *NOTE this cottage has few stairs and is near ground level. 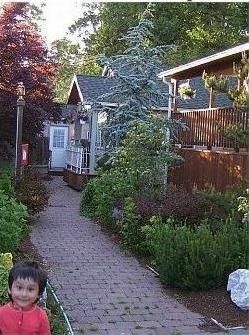 Some of my earliest memories were coming to Birch Bay as a child-- over the years I have heard folks tell me how they were here when they were a child-- how ironic, I am now raising my 6 year old son here in Birch Bay and we absolutely Love living here! As they say in the real estate industry "Location, Location , Location"... it doesn't get any better than this! 200 feet to the beach! Granite countertops , radiant heat, full kitchen, BBQ, beautiful landscaping, and more! Comfortable and had all we needed. Clean 😊 loved the art and antiques. Water Slides just 4 blocks away, Go carts for the kids.,Shellfish harvesting ( check for restrictions),Bike and kayak rentals close by, Golfing at Grandview golf course,MV Plover Ferry at Semiahmoo, birdwatching with Audobon Society, Some of the best parks in Washington State, Hovander Lanvender gardens, Bellingham Farmers Market, Silver Reef live entertainment, Mt Baker, Ferndale Farmers Market, Packers Restaurant at Semiahmoo, Loomis Trail Golf Club, Fairhaven Outdoor Cinema's (summer only), Jims fishing charter (Blaine), Outer Island Whale watching expeditions, Local wine tasting and wineries, Lynden Fair( August).